Final look at the Plot and Publish Tab. Specifies whether the offset of the plot area is from the lower-left corner of the printable area or from the edge of the paper (PLOTOFFSET system variable). 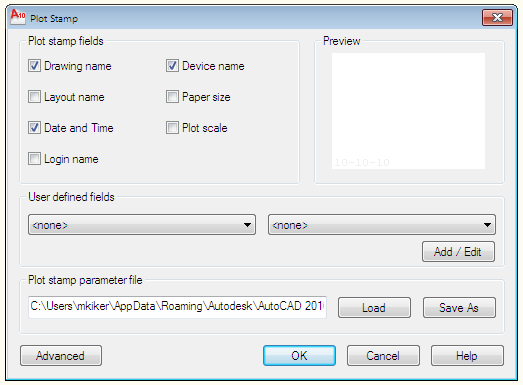 Depending on your plotter you may have to fiddle with these setting. Specifies that the plot offset is relative to the printable area. Specifies that the plot offset is relative to the edge of the paper. Opens the Plot Stamp dialog box. So much here that it will need to be another post at some point. NOTE: Most people don’t use this plotstamp any longer. They use RTEXT with Diesel or more recently – FIELDS. 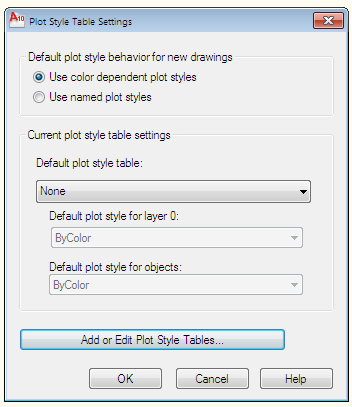 Opens the Plot Style Table Settings dialog box.